This article and the next two will be based around character themes that show up ever so briefly (or for a while, depending on how long you stay on the screen ;P) in Kingdom Hearts Union Cross. 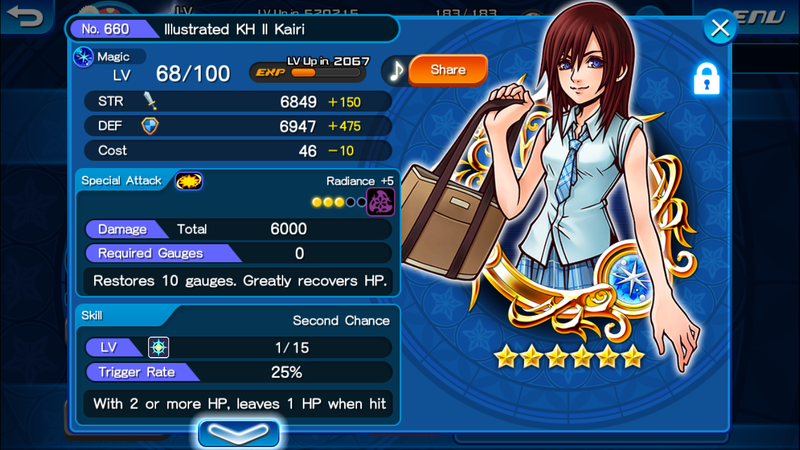 I’m not sure when exactly they added in this feature, but for certain characters (Casual Roxas, Illustrated Xion, Illustrated KHII Kairi, Illustrated Sora, HD Roxas, and possibly others), when you tap on their medal info, their theme plays as you check out their stats. I think it was a wonderful addition, and props to whoever had the idea. In today’s article, we are going to be talking about the musical theme of one of the central characters of Kingdom Hearts, Kairi. If you listen closely to the original track, you will hear that the main melody is played by not just one instrument, but rather a few. This is what I deem “passing the (musical) torch”. Similar but definitely not the same as “call and response“, a melody being passed between instruments is a nice way to include some subtle variety in a piece. In this track, since both the melody and the rhythms are so very repetitive, it is a nice addition to have a change in sonority every few bars. Sometimes the piano takes the melody, sometimes the flute plays it, sometimes the violin joins in, and sometimes they all play in unison. Either way, the main melody is not being changed or altered, but rather passed around.